The Prince of Wales invited 30 of the world’s leading tropical forest scientists for a two-day conference in London earlier this week. 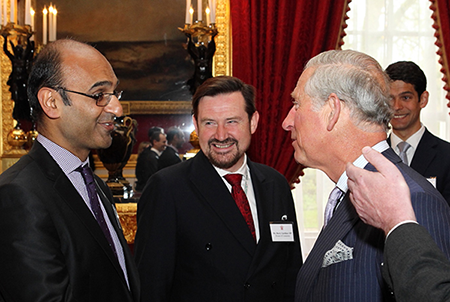 Led by Professor Yadvinder Malhi, from the School of Geography and the Environment at the University of Oxford, the team of scientists drafted and agreed the StJames's Palace Memorandum on Tropical Forest Science. The conference was closed with a speech by the Prince of Wales, described by The Guardian as 'his most outspoken attack yet on the world's failure to tackle global warming'. The Prince of Wales said: 'It seems to me that there could hardly be a more important endeavour than the task of conserving the world’s remaining tropical forests'. He called the destruction of rainforests 'the greatest risk that we have ever faced', and warned that global leaders 'must act now' because 'the risk of not doing so is far too great'. The event has received significant media coverage (links below). The Prince of Wales has for many years been interested in the conservation of tropical forests, and has supported numerous initiatives in pursuit of that cause. He set up the Prince’s Rainforests Project in October 2007 to find practical solutions to slow tropical deforestation and combat climate change. This is now part of the International Sustainability Unit (ISU). The ISU seeks to build consensus around solutions to some of the key environmental challenges facing the world, including tropical deforestation, food energy and water security, and resilient marine fisheries.